Once a simulation is made, the confidence level that it will work in actual is very high. This will reduce development lead time and save parts cost for trial and error. 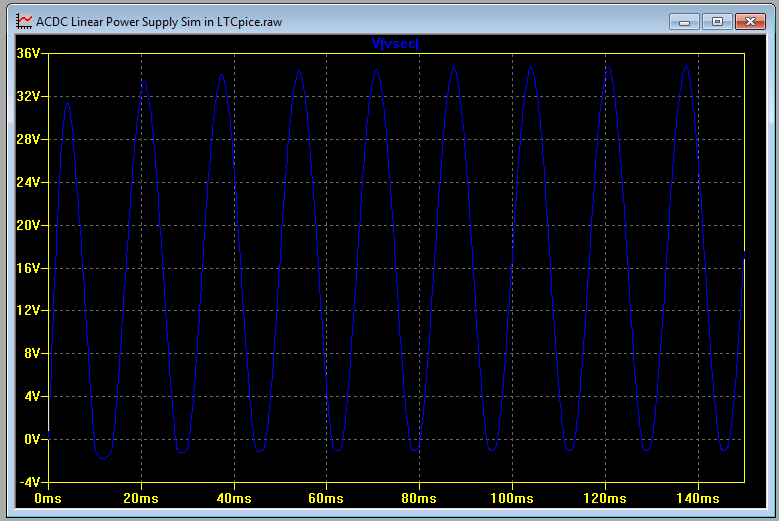 Let me share you ACDC linear power supply simulation in LTSpice. For more tutorials, join electronicsconsultation. 2. R2 – This is the primary winding resistance. 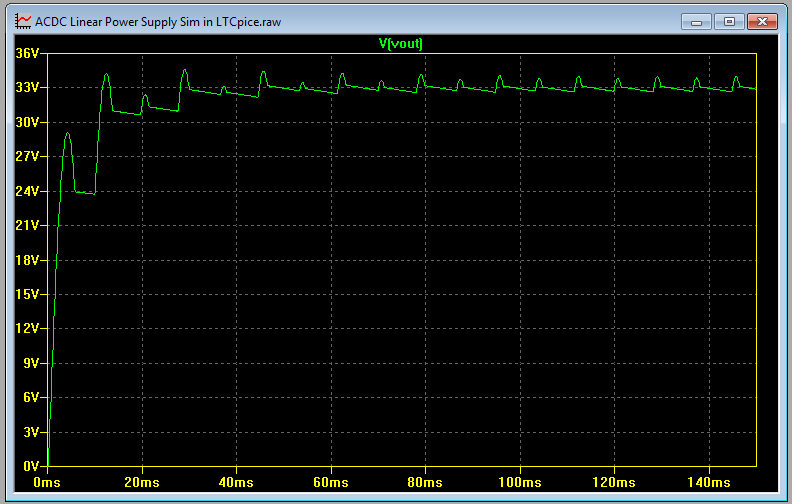 In LTSpice, a small resistance in series with the primary winding is needed for the simulation to proceed. 3. 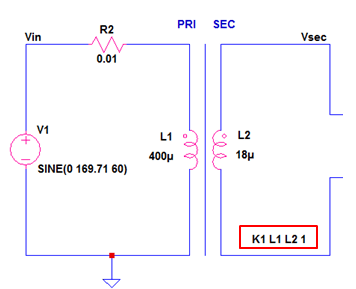 L1 and L2 are primary and secondary inductances of a transformer. This is how LTSpice models a transformer. 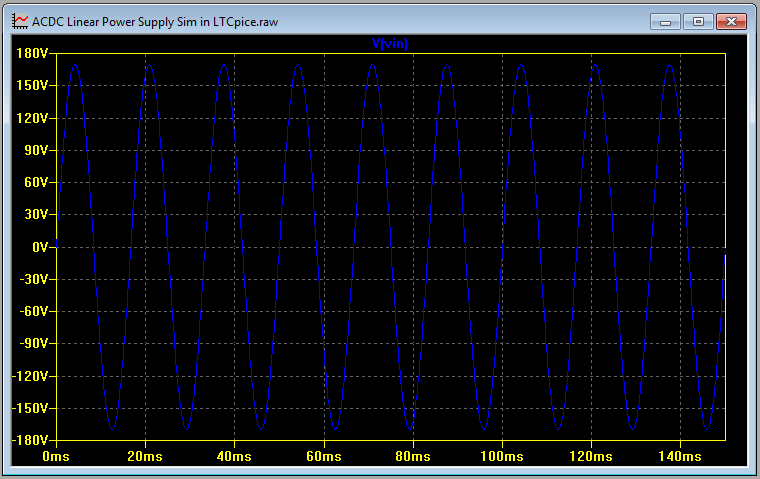 LTSpice does not have an option to enter a turns ratio like other simulators. Instead, the primary and secondary is related through the inductances. In buying a transformer, be sure it can support the desired frequency, voltage and current rating. This is the way LTSpice understand a transformer. K1 means a declaration number 1, L1 and L2 and the primary and secondary inductances while the constant 1 is the coupling coefficient. Unity means a perfect coupling. Non-ideal coupling is always less than unity. 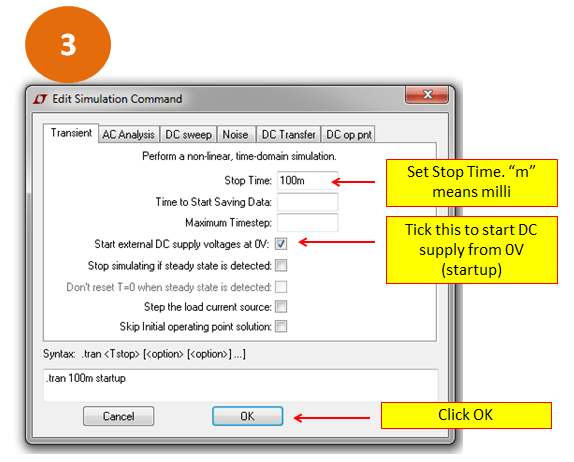 This is a transient simulation command. To set, follow below guides. 6. D1-D4 comprises the bridge rectifier. A bridge rectifier is preferred because it can give higher RMS voltage and able to use smaller filter capacitor. 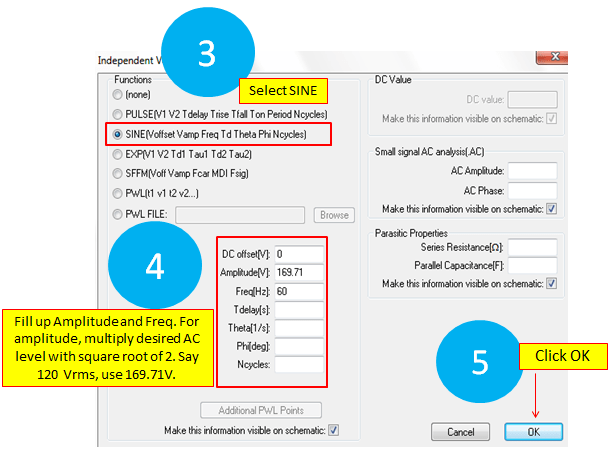 The critical parameters to take note are current and peak reverse voltage. 7. C1 is the filter capacitor that makes the pulsating DC to almost pure DC. The critical parameter to take note is ripple current and voltage rating. 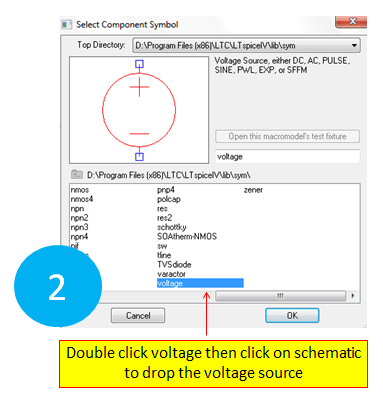 A voltage regulator is needed on the output for more precise and critical applications. The most important parameter to consider is the power dissipation of the regulator. The power dissipation of the regulator is just the difference between input and output voltage of the regulator times the load or output current. In below circuit, U1 is a linear regulator. The difference between the voltage on C1 and the output voltage should be not too big to minimize power loss on the regulator. However, do not make the difference very low also because linear regulators have minimum dropout voltage requirement for proper regulation. For higher regulator dissipations, use heat sink to cool it off. An external heat sink is preferred. For SMD regulators, make the PCB pad as big and thick as possible. 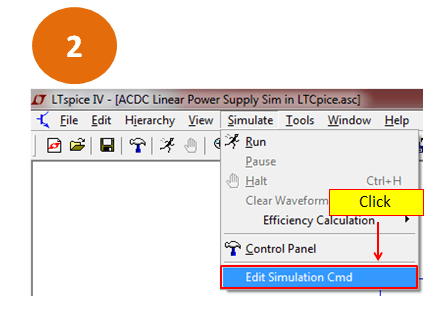 I hope you enjoy this another tutorial “ACDC linear power supply simulation in LTSpice guide”. If you have inputs, feel free to add comments below. 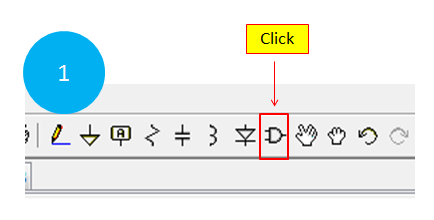 Excellent tutorial. Searched hard for this one. The LTSpice manual is so vague. One thing I don’t understand; Why must there be a ground on both side of the transformer? I tried taking it out, and it wouldn’t work. Doesn’t that defeat the purpose of isolation provided by the transformer? Also, the circuit won’t simulate if the R2 is omitted and I don’t get why! 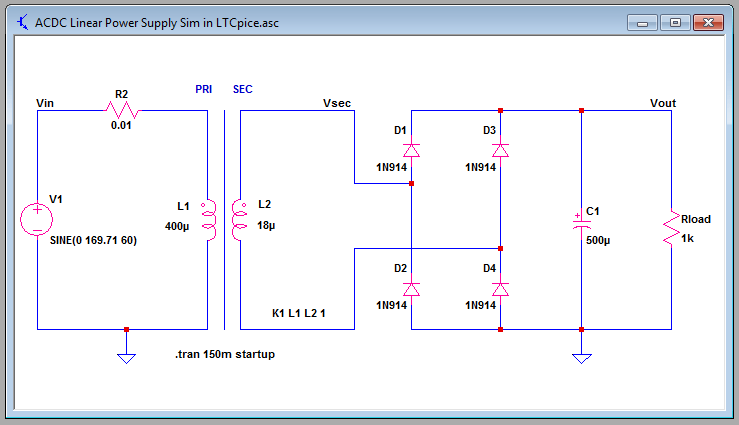 Circuit simulators need a ground reference to run. In actual application, you must not put the same ground node to the primary and the secondary so that not to defeat the isolation. R2 is needed because a voltage source applied directly to an ideal coil (0 resistance) will cause a short circuit to the source. Is the “Parasitic properties : Series resistance” of the voltage source not the same thing as R2?